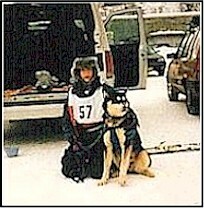 I am a 13 year old Skijorer / Junior Musher. I am in the 8th grade at Wasilla Middle School. I own 3 dogs. I live with my Mom, Dad, and younger brother. 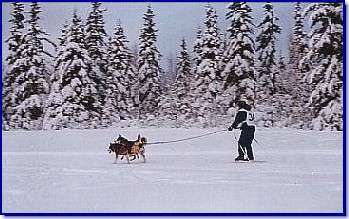 I race with NASSPA (North American Skijor and Skipulk Association) and have raced in the 1 dog class for the past 2 seasons. I enjoy sprint races with my dogs, x-country skiing, and spending time with my dogs in general. 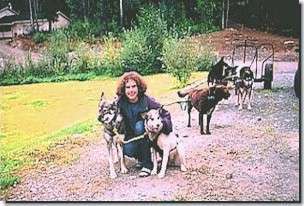 I am a member of NASSPA, and the Chugiak Jr. Dog Mushers. My primary sled dog activity is Skijoring. I have been involved with sled dogs for 3 years now. 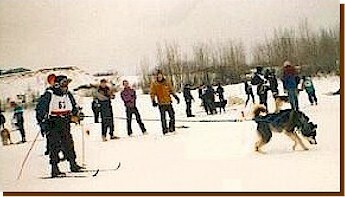 When I had a ride in a dog sled (by a sled dog tour company) at the Fur Rondevous when I was 3. I can't remember my first ride with someone else's dogs, but my first run behind my dog was great. 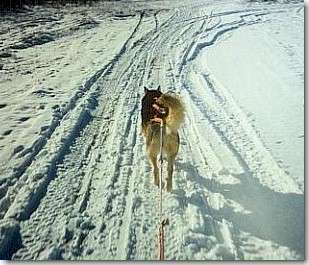 I didn't have a real dog sled yet so I hooked up a little plastic sled to my husky, Fang, and we followed a car down the road. It was fairly uneventful. Almost everyone with NASSPA and the Chugiak Dog Mushers members that have helped me through rough spots in my training and racing. All my dogs live in individual runs, so I usually clean all runs, water, run (or walk), play with and train my dogs before they eat. And even then, they all eat in their own runs. I tried feeding them all at once in the same area, but I ended up breaking up a fight. Blame yourself, not your dogs. Don't be afraid to ask a question, no matter how stupid it might make you look. I try to stay happy around the dogs. It can be hard at times, but it's very important. It's also very important to keep your kennel as clean as possible, not only because it looks good, but also because it keeps the dogs happy and healthy. It's also important to feed the dogs good quality food and to socialize them properly. I work with Alaskan Huskies and a husky mix. I look for a dog that is going to be able to pull me, alone, without my help, on a skijor run, and I try to go off of the dog's previous running record also. I require that the dog is going to be able to stand up to running in front of skis for 90% of the runs that it will be on during the season. I also want, but don't require, a dog that is going to let strange people handle it. My all time favorite dog is my 3-year-old leader/wheel dog, Fang. He's trained every dog in my kennel, and my cousins' kennel to lead. He is a one-person dog and will only run for me, but he loves everyone. His only two flaws are that he is a little on the slow side (he's half Chow-Chow) and the second you tell him to stop, he stops, immediately. I play with them and walk them with my dogs, and what I want them to do is to walk right up there with my dogs as every dog in my kennel is REQUIRED to be somewhat of a leader. I will go out skijoring with my best command dog, (but unfortunately, he's also my slowest dog.) Fang, pulling alone with the pup on the second tug with it hooked to the pups collar. I run them like this until the pup is pulling from the neck up next to Fang. I want the pup to be active and I want it to be playful. When I take them home. I work with dogs that just aren't making it individually until I feel that they are ready to really kick in and start working in the team. I have a yearling right now who was really testing me, he was both EXTREMELY shy and kennel sour (always wants to go back to his kennel). I put him on a special, customized training program, and now he's my hardest worker, and is almost done with full command leader training. I usually train and race semi-competitively, meaning most of the time, I am just racing for fun, but some of the races I will train and race to win. I want every dog in my to be a semi-leader (Gee, Haw, Lets Go, And Whoa) by the end of November. If I have one dog that's just not making it in the leader spot, it gets to stay in the kennel unless I'm running a 3 dog team. I chose races by the time frame the race is in, and how ready my dogs are for the race. Distance is a deciding factor, as well as how far and how long the dogs will have to travel to get to the race. It takes dogs with the Attitude, Drive, Speed and Endurance to get through the pressure of any race, whether it's a 1/2 mile, or 1,000 miles. I think that more people will start to get into the recreational side of the sport, but about 2 of every 10 are going to turn competitive. Treat all dogs, yours and others, in a humane manner. Offer people a chance to hook up one of your calmer dogs and try the sport if they seem really interested in it. They play a large role in development. Most clubs hold beginners clinics, and fun runs and tours aimed at the recreational side of the sport. Some clubs have a recreational class in their race classes. The Rondy last season (1998) had to be the best race for me, ever. I was running Fang in the Women's 1-dog 15 Km. class. We had to go through tunnels and over bridges and we had to do a lot of head-on passing. I trained Fang two years ago to chase anything that passed us, (that was before I started racing) and we got passed a lot. The most memorable part was actually after the race when I was checking my time before becoming a handler for the 8 Km. racers. That John Harris, one of the people who raced in the 15 Km. class and actually came in behind me, commented that he saw my dog "Just take off and really Go!" I looked at him like he was crazy and then asked him if he was sure it was me. He said "Yeah," and that there was one team behind me and I had just been passed by another racer. That would explain it. You have to take everything at your own pace, if you don't, running dogs won't be fun anymore.